When one of your favorite film directors works on one of your favorite TV shows, that’s pretty incredible luck. If a TV director graduates to film, they tend not to look back. If a director starts in film, they tend not to usually stray much into TV. 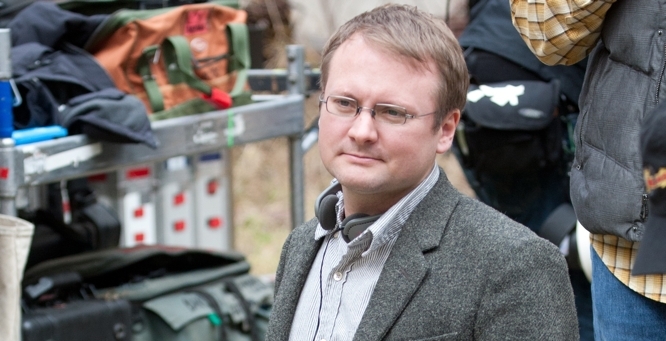 Fortunately, Rian Johnson isn’t either of those directors. After writing and directing Brick (2005), his hard-boiled teenage noir, and The Brothers Bloom (2008), his probably-too-clever-for-its-own-good-but-still-awesome-anyway con-men dramedy, Johnson stepped in to direct a season 3 episode of Breaking Bad, a well-rated AMC drama that had yet to burst through the cultural stratosphere, as it would a couple years later. Like I said, the chances of a feature film director doing TV work is unusual, but Breaking Bad and Johnson turned out to be a natural fit. Full disclosure: Johnson’s previous efforts — the two I mentioned and Looper, which I’ll get to — are three of my personal favorites in the last decade. He’s the kind of movie geek writer-director that has a truly ridiculous amount of intriguing ideas rattling around in his brain, so each of his three films have their own quirks, fun moments, and Big Ideas. My only complaint is that he’s only made three movies in ten years. Thus, it should be no surprise that I would rank two of Johnson’s three episodes in Breaking Bad’s top 5 ever. TV is essentially a writer’s medium, but some shows, particularly Golden Age shows, leave room for a director to imprint their indelible signature. With its easily identifiable visual style, Breaking Bad is surely a director’s showcase. I decided to analyze Johnson’s three episodes, taking a close look at the visual language of each, not necessarily the dialogue, since he didn’t write it. Let’s start with quite possibly the greatest bottle episode in TV history. What in the world is a bottle episode? When a show’s budget is getting a little tight, you might see its makers craft an episode that takes place in one location and only features a few characters, at most. It’s basically a minimalist exercise brought on by budgetary necessities. Breaking Bad had kind of done this before with “4 Days Out” in season 2, but “Fly”, the late season 3 showstopper, was a different animal. Opening with a super-closeup of a fly had to be a strange sight for fans expecting us to jump right into action like Breaking Bad does so often. It was the first sign that this would be a polarizing episode among viewers. Post-opening credits, we only see a blinking red light filling the screen. It turns out it’s from the smoke detector Walt is staring at while he can’t sleep. We can see early that Walt is in a distressed state. 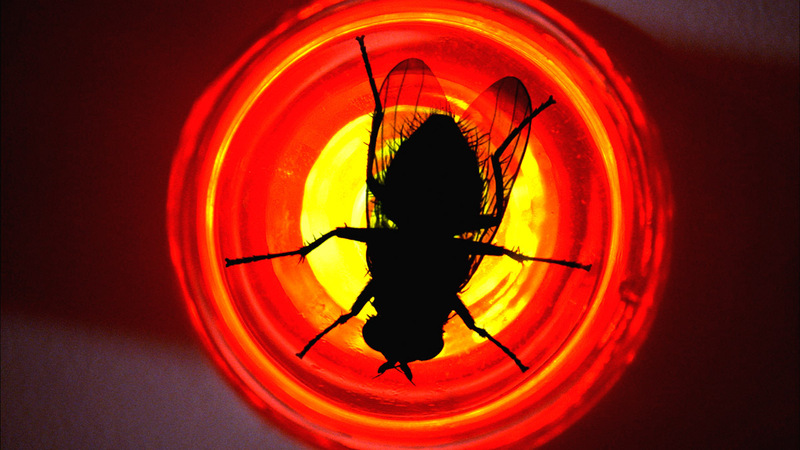 The clever thing about “Fly” is that it doesn’t mind giving us a helping of comedy with its emotional distress. In fact, the first half is basically slapstick entertainment as Walt tries in vain to kill a lone fly buzzing throughout his underground meth lab: Look, there’s Walt comically swatting at the fly with his clipboard! And there he is throwing his shoe at it! Of course it got stuck in the light fixture. How hilarious! However, what begins as slapstick comedy suddenly shifts into an emotionally devastating, philosophical slow-burn. 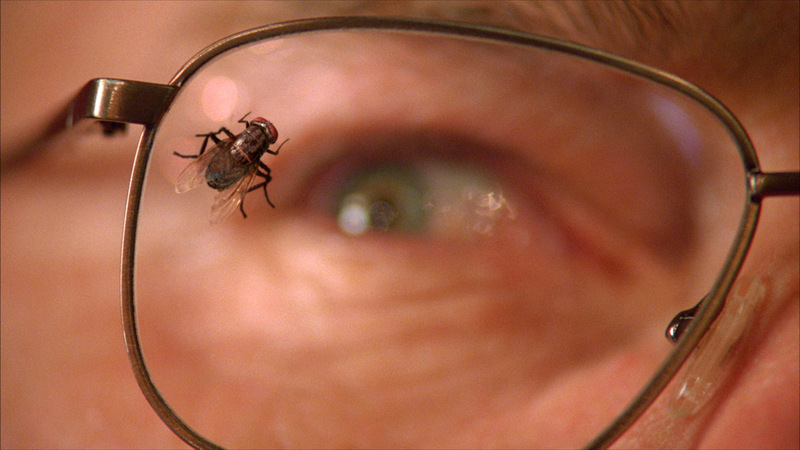 After a concerned Jesse gives Walt sleeping pills to knock him out so he will quit worrying about the stupid fly, they continue attempting to swat it while a fatigued Walt gets ruminative on his sorry state. He rambles about how he wish he would’ve died at a time when his family appreciated him more. Then he complains about Skyler’s lack of understanding by basically saying that there “must exist some combination of words” to make her see why I need to produce and sell methamphetamine. That’s a classic Walt line right there — always thinking he can explain away his horrible actions. He finishes by noting that science teaches us that life is random, but his own experiences (like him meeting Jesse’s girlfriend’s father on the night he causes a plane crash) tell him otherwise. It only becomes more clear throughout the series that Breaking Bad’s own philosophy suggests life is not random, that things like morality and fate are very much real. “Fly” climaxes with an incapacitated Walt barely holding a ladder steady while Jesse questionably stands atop it trying to finally get the fly. For a hot second, we are led to believe Walt is going to confess his role in Jane’s death. He doesn’t, but the tension between guilt-ridden Walt and unknowing Jesse is unbearable. This is a hugely stylistic hour, even for Breaking Bad. Almost the entire episode takes place in the lab between Walt and Jesse. Of course, Johnson provides us with several astounding shots and camera movements, such as the fly landing on Walt’s glasses or the camera attached to Jesse’s brush as he cleans the meth-making containers. However, it’s the haunting, evocative last sequence where a fly buzzes around Walt’s bedroom as he tries to sleep that leaves the lasting impression. It teems with foreshadowing and dread. After “Fly”, Johnson was officially 1-for-1. When “Fifty-One” aired, Johnson’s biggest film to date, Looper, was about a month away from hitting theaters. This means that just as Johnson’s career was about to go mainstream, Breaking Bad was simultaneously taking off into the stratosphere due to everyone raving about it like it was actual meth. 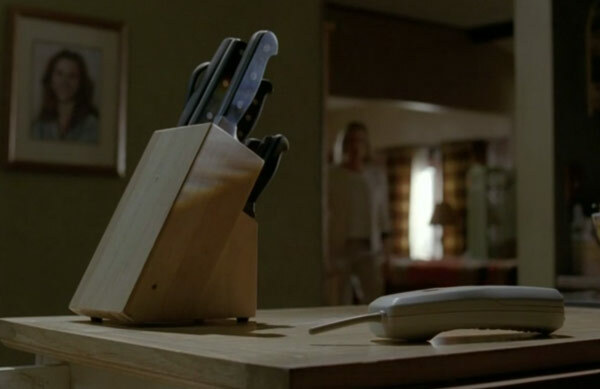 Not nearly as stylistic as “Fly”, this ep advances the Lydia plot and takes stock of the Walt/Skyler relationship after the former moved back into the White household without total consent from Skyler. However, there are still a couple of gorgeously compelling shots to note. First is the closeup of Walt’s bald head bleeding as he shaves it — a strangely jarring visual. 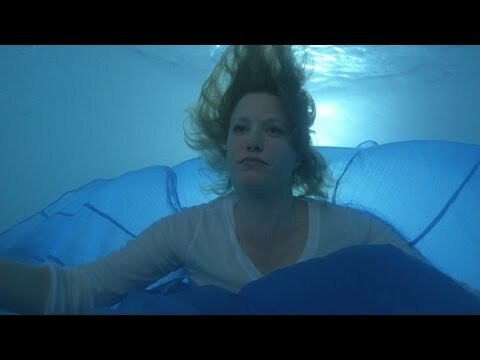 Then there is the subtle elegance of the shot of Skyler underwater in the White’s pool. She waded in as Walt was blabbing about his recovery, like she couldn’t stand to hear another minute of his bluster. As she floats, her blue skirt illuminates her from behind, creating an eye-popping, instantly memorable image. While “Fifty-One” surely isn’t as riveting as most episodes, the emotional violence between this messed up married couple is devastating. Walt challenges Skyler on what her alternative plan is to keeping their children safe from the dangers of the meth business. She tells him that she will just have to wait for the cancer to come back, delivering a haymaker to a stunned Walt. Johnson ends this quiet episode with a closeup of Walt’s watch ticking away his life, foreshadowing his certain downfall. Over a year and ten episodes later, we come to Breaking Bad’s finest hour. In the third-to-last ep, creator Vince Gilligan and his cast crank up the drama to 11 for the final stretch. “Ozymandias”, directed by Rian Johnson, is remarkably cinematic (wonder where that came from…) while launching the story forward in heartrending fashion. 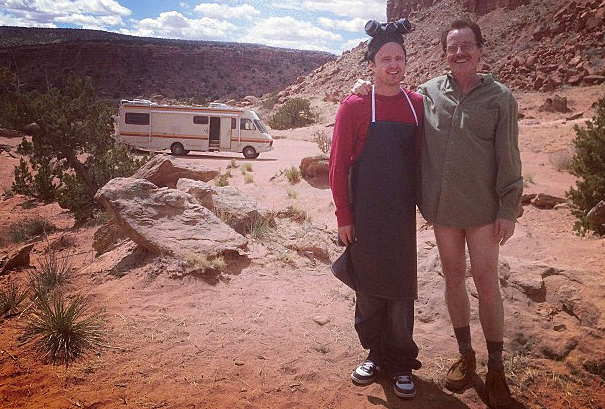 The beginning transports us back in time to Walt and Jesse’s first RV cook out in the New Mexico desert. We see Walt before he lost his hair and Jesse before his soul had been crushed. 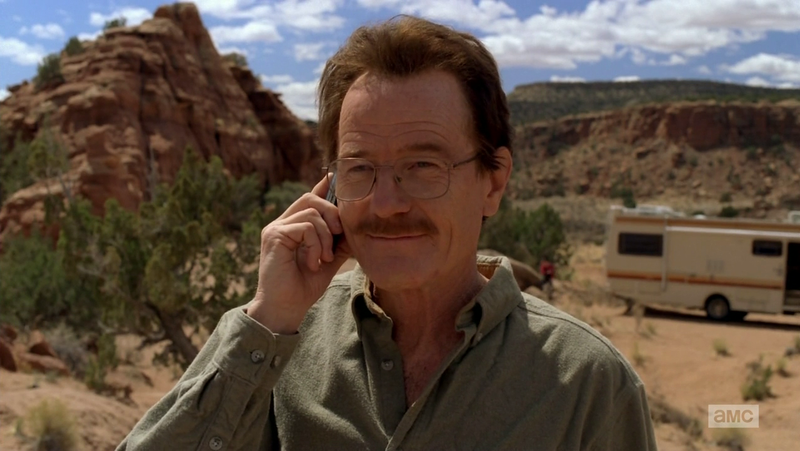 Walt treks out to call (and lie to) Skyler. It’s a joy to see these characters again before everything goes to hell. Apparently, these were the last scenes the actors shot before wrapping. It was like the show was giving us one last breather. Of course, it doesn’t last long, because this scene fades out into the bloody aftermath of Uncle Jack’s shootout with Hank. Johnson presents a few wide-angle beautiful landscape shots to show just how marred everything is by horrific violence and nihilistic greed. After Walt and Nazi Jack briefly negotiate over Hank’s life, Jack raises his pistol and executes Walt’s brother-in-law. When the shot rings out, Walt drops to his knees in a perfect low angle, with the sun flaring into the picture behind him. Next, he topples to his side and Johnson brings the camera in on just his face. 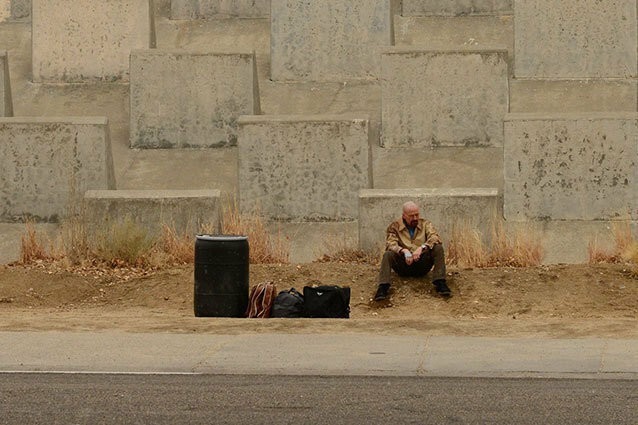 Of all the artfully composed shots in Breaking Bad, this one is most meaningful and evocative. Here it helps to understand a little of the episode’s background. Ozymandias is a sonnet by the English poet Percy Bysshe Shelley. Here’s Bryan Cranston reciting it in his darkest and most epic voice. Ramesses II, also known as Ozymandias, was one of the Egyptian Empire’s most powerful pharaohs. His statue, broken and lying on its side in the middle of the desert, was brought back to Great Britain in 1818. In advance of the statue’s head arriving, Shelley penned a spectacular poem about the impermanence of even the greatest empires and the dangers inherent in overconfidence. It became maybe the most recognizable sonnet in history. For this episode, Johnson suggests that Walt and Ramesses aren’t so different. Both of them toiled to build up empires, only to end up with their head in the dust. Walt has spent so much time telling himself and those around him that he can keep his family safe, but now, with his life unraveling, he lies in ruin. The parallel between Walt and the old pharaoh Johnson evokes in this one image is beyond wrenching. However, the tailspin isn’t over. Next, Walt gives up Jesse to Uncle Jack and requests him killed. They decide not to, but before the neo-Nazis kidnap Jesse to force him to cook meth again (what a sentence), Walt informs him that he watched Jane die, and did nothing to help her. In “Fly”, if you recall, he edged up to the precipice of admitting this out of guilt, but also respect for Jesse. Here, he actually does it, but out of nasty, knife-twisting spite. Incredibly, the performances that Johnson gets from his actors never tips into melodrama, despite the insane emotional violence taking place. Similarly, the scene back at the White house is a freight train of emotional force, but somehow Johnson and his actors walk the tightrope of melodrama like the pros they are. It’s one of the most powerful scenes in all of dramatic television. You know the one I’m talking about: a distraught yet determined Walt comes back to pack up and disappear when Skyler and Walt Jr. show up and, thinking he’s been taken into custody, question why he’s there. Walt does his usual distracting jibber-jabber, but lets it slip that Hank is dead. Still set on leaving, Walt demands his family pack up their things. The next shot we see still brings chills down my spine — and I’ve seen it three or four times. Phone or knife. Knife or phone. When she picks up the knife, things get real frantic. She cuts his hand (in virtuoso slow-motion from Johnson) and a domestic knife-swinging scuffle ensues. I’m sure they used doubles for this, but the terrifyingly natural physicality of the fight left me thinking anything could happen. By the time Jr. defends his mother, Walt takes Holly, and Skyler desperately runs into the street as that horribly intense music pulsates, you’ve completely forgotten to breathe for about six straight minutes. It’s scorched earth televisual family drama of the highest caliber. This is thanks to Johnson’s control of the images and the performances he gets. You’d be hard-pressed to find a scene where Anna Gunn, RJ Mitte, and Cranston are more on top of their game. Later, there is the phone call between Walt and Skyler while the police listen in. Walt verbally brutalizes his wife, telling her these are the consequences for disobeying him. To me, this is Walt attempting to clear Skyler’s name in front of the police, but the darkness in his voice reminds us of Heisenberg, even if that persona has totally come apart at the seams by this point. The brilliance in this scene is the juxtaposition of the two calls, this one and the flashback at the episode’s beginning. It all started so harmlessly. He was just making a little money to provide for his wife and two children after the cancer takes him. Now his horrid actions have brought destruction on every facet of his life. From the intimate small-scale of “Fly”, to the quiet damage of “Fifty-One”, to the grand dizzying highs of “Ozymandias”, Rian Johnson left his mark on one of the great TV shows of all-time. That would be a career highlight in and of itself, but, probably as I type, Johnson is currently working on Star Wars: Episode VIII. So, yeah. This guy is only 41, has three excellent films behind him, and a freaking Star Wars movie on the way. I don’t think he needed Breaking Bad on his resume, but thank goodness he wasn’t too cool for TV.